Today was Day # 6 of Chocolate + Hearts and Flowers Theme Week -- with an emphasis on the flower side. 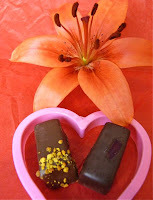 These two chocolate covered caramels from Vosges (Chicago, IL) were part of a larger, exotic caramel assortment box. The "Sunshine" caramel contained Tupelo honey, bee pollen and milk chocolate. The bee pollen topping flavors came through first, and then the honey notes kicked in. It was a very nice tasting experience. The "Rosey" featured rose water, pink peppercorn and dark chocolate topped with a red rose petal. I liked the fairly strong, yet authentic rose flavor, which shaded into pink peppercorn flavors and texture. My only quibble, it was just a little too sweet for me. But, that is always a risk (or a benefit, depending on your perspective) of trying to make the perfectly balanced, flavored caramel.